Would you like your flat or low-slope commercial roof protected with a long-lasting coating that will extend its life while lowering your energy costs? Luckily for you, that is an option! 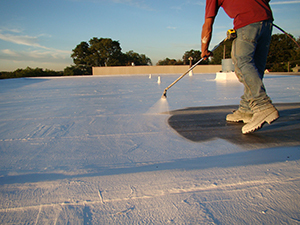 An elastomeric roof coating can be applied to many roofing units including modified bitumen, all single-ply membranes, built-up and metal. Elastomeric coatings are an excellent option for facility managers that are looking for the most bang for their buck. They are a long-term, budget friendly commercial roofing solution. How does an elastomeric coating benefit you? Energy Efficient – Elastomeric coatings are usually white in color and reflect thermal energy rather than absorbing it. This gives your HVAC system a much-needed break and helps lower your energy costs. 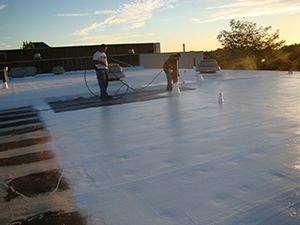 Saves You Time – This coating is applied quickly and your day-to-day business procedures will not be interrupted, unlike with a total roof replacement. Certified – Our elastomeric coatings are ENERGY STAR®, LEED and other energy code requirements certified! 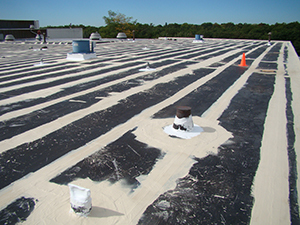 Cost Cutting – When compared to a total roof replacement, coatings will win every time in the savings department. For the budget-conscious building owners, we can save you money and add years of life to your roof. 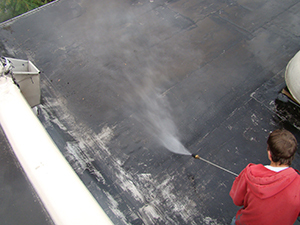 Fortification – Coatings create a roof that is sealed, water-tight and safe from most anything that mother nature can throw at it. 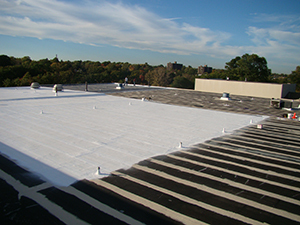 Lessen Your Carbon Footprint – With our elastomeric coating you will not be adding to local landfills by removing your old roof, which is another way we save you money and keep environment a little cleaner. Regardless of the season, elastomeric coatings are able to expand and contract with fluctuating temperatures. During the day, they expand and after the sun sets, they will return back to their original state as they cool. Because of this, there is a reduced risk of cracking. The demand is high for elastomeric coatings. Business owners and property managers are quickly realizing the many ways they can save time and money. Call us at (717) 442-0979 to find out more. Our knowledgeable staff will gladly answer all of your elastomeric questions and schedule a time for us to provide you with a roof inspection. 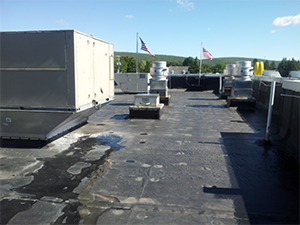 Let us help you get the most out of your commercial roofing asset. We look forward to earning your business.